Neuropsychological studies prove that the immediate block span can depict deficits that are not assessed by common tests for the registrations of the verbal memory span. Assessment of memory performance and cerebral dysfunctions (quantification of mnestic deficits) by means of the decision whether or not an item is newly presented. Assesses the mechanical-technical understanding using animated items (instruments, to which a construction plan must be assigned); to be used with adolescents and adults. Examines a subject's ability to remember memory material that is difficult to verbalise. It may be administered both to healthy subject and to patients with cerebral defects for the purpose of assessing specific memory disorders. Provides a fair and highly reliable assessment of the ability to inhibit overlearned answers to simple tasks. Assessment of the central-nervous activation (arousal) with the help of threshold values, when high frequency light is recognized as constant light. Measurement of Perceptual speed and Accuracy / Resistance to error as basic elements of attention. 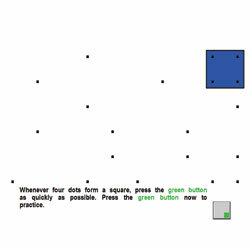 Moreover, the test is suitable for the diagnosis of perceptual disorders, e.g. dyslexia. Measurement of reactive stress tolerance and reaction speed and assessment of attention deficits in situations requiring continuous, swift and varying responses to rapidly changing visual and acoustic stimuli. Assessment of sub-functions of attention, suitable for subjects from the age of 8. Test battery for the assessment of focused attention. Test battery for the assessment of visual and spatial alertness. Measurement of Perceptual speed and Accuracy/ Resistance to error as basic elements of attention. Moreover, the test is suitable for the diagnosis of perceptual disorders, e.g. dyslexia. Test battery for the assessment of alertness.